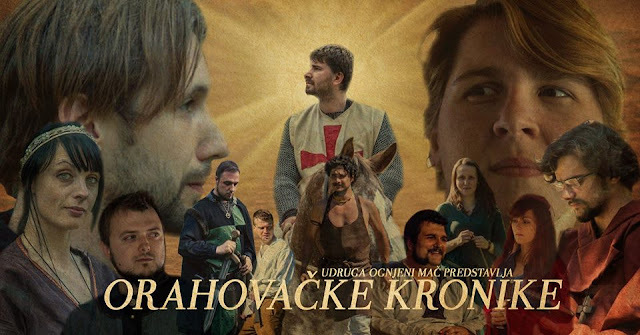 After one year of nothing much going on with Ognjeni Mač, this April 1st we got treated to the announcement for Orahovačke kronike. 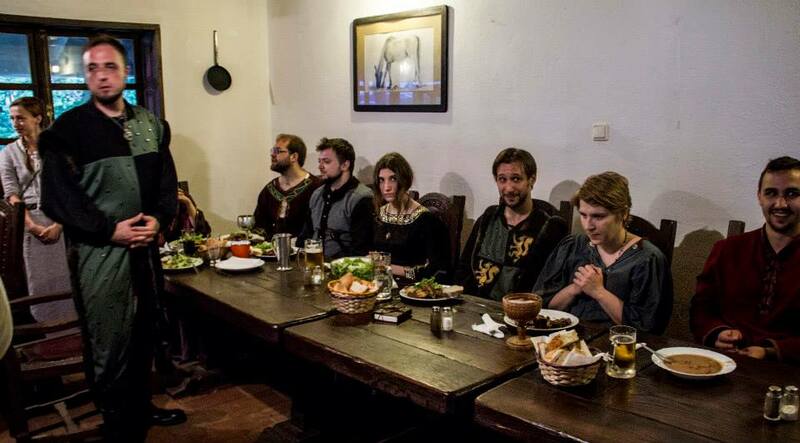 A medieval larp which was supposed to be a simulationist/immersionist soap opera, instead of a fantasy combat larp. 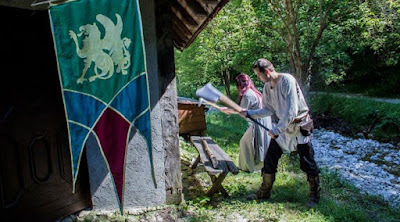 Minimalist rules (available here in Croatian, but they're largely the "improvise everything" type), unthinkable years ago but nowadays common on a lot of Croatian larp, rounded up the announcement and made us all go "seriously guys, this is one of the best April Fools Day jokes ever". But it turned out to actually be real. Play site: Eko selo Žumberak. No floods this time. 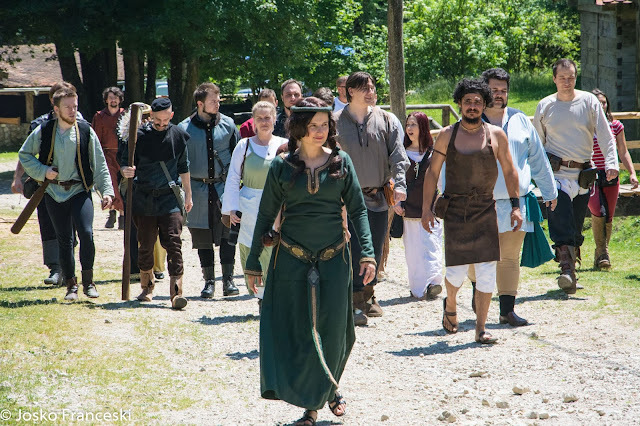 Historical accuracy is often a touchy subject when it comes to larpers, reenactors, living history buffs and the others. 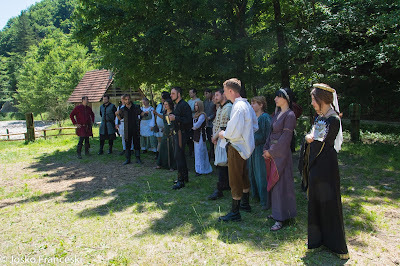 We were supposed to portray 12th century characters with reasonably accurate visuals - we were not terribly historically accurate on that larp, there were a few costumes which missed a century or were made of inauthentic materials, but overall this was a step forward in establishing an uniformed, historically accurate look - something most other Croatian larps don't pay too much attention to. If you're interested, you can read more on the subject of authenticity on larps here. The larp was set in a fictional village to Orahovac in Croatian Slavonia region. Many have noted that the village has the same name as a certain alcoholic drink, or that it's very similar to the real-life town in Slavonia called Orahovica. 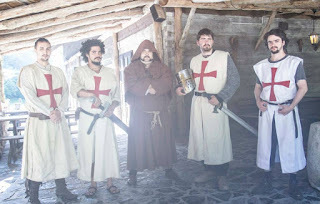 The year was 1148, and it was set during the Second Crusade, which left the village depleted of young men who went off to fight a war, and there were few peasants left to do plenty of work. The village was divided between the two noble families: the local family Gorjanski, and the newcomers - the Kis family which arrived from Hungary. 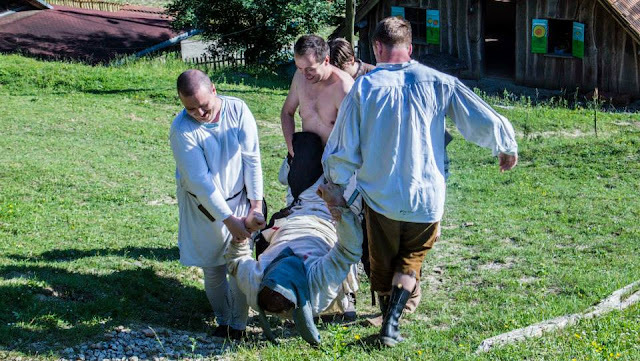 Noble families and peasants serfs who worked for them were all portrayed by players. My character was called Slavoljub Zec, and I was one of the serfs working for the Kis family. Unfortunately, as it's common in Croatian larps lately, we got hit by a wave of cancelations, and among others this included the two players who were supposed to portray my son and daughter. One of the organizers, however, played my niece for a while and we got some cool role-playing moments. From my perspective, most of the day was spent talking to people - especially other serfs - and working whatever tasks we were assigned to by the nobility. Which included handling a drunken guy who wandered into a village, and later conveniently forgetting what happened and what we saw. Not like anything suspicious happened at all. The central part of the event was a wedding between a couple from two peasant families which served different masters. This happened on Saturday, about 6 hours after larp started. 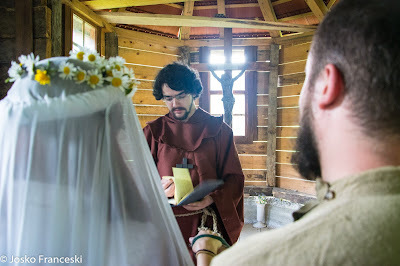 Most of the early larp content was about preparations for the wedding, talk about the wedding, a few scandals leading to wedding, and the wedding itself was done properly - with procession, church ceremony, and prayers and rites in Latin, of course. Because 12th century. After the ceremony, it was the time for reception - which was done in the Eko selo restaurant, the meal which we paid for. Bean stew with sausage and grilled meat were on the menu. After the reception was when the trouble started. Well, there were a few issues before - since Eko selo was not exclusively booked by us, we had some non-players walking by, there was a guy making a fence with a chainsaw and another part was booked by a local country band (yes, a country band from Croatia - it's not a typo) called Picksiebner. But players were mostly ignoring these issues, since otherwise larp worked well. The drama started in-game and turned out-of-game, when the innocent Medieval soap opera suddenly became Game of Thrones. The killing - done by the Kis family - started in order to protect a secret, and then it kinda escalated from there. In the end, most characters from the Gorjanski family - and some of their serfs - were dead, and their players were pissed off because that happened. A few attempts to save character lives were done amidst that chaos, but nevertheless - players who got killed got angry OOC. The night was late, so after a visit by a NPC party and talking to GMs the game was paused until morning - when we received a party of templars, who - after a bit of finding out what was going on - press ganged the Kis family (and everyone else who committed a murder) into the Crusade, which provided some closure for the players whose characters got killed. And so ended the first Orahovačke kronike larp - it's planned to be a campaign, so it's possible there will be sequels. Besides all the drama (and a few other kinks) it was fun. Photos by Petar Ratković and Joško Frančeski.